Call now to speak with an experienced designer about your annual report. Are you looking for an annual report designer? Look no further than ACF Consulting. Our team of experienced report designers in Tampa can provide you with an annual report that shows off all the great things your company did last year. Our friendly and experienced staff can help you with you from concept to completion. We are annual report designers as well as designers of a variety of marketing materials. Are designs are as unique as our many different clients. We can provide you with a corporate identity, brochures, folders, promotional items, or even a fully custom website. Our designs are always "from scratch" and never based on templates, so you can be sure that your design is unlike anything you have seen before. Click here to view a variety of our marketing and web design samples. Along with marketing, ACF is a full service IT company. We can provide you with a variety of different solutions for smoother business operations. Click here to learn more about our IT solutions. A professional annual report designer can help give investors a good impression of your company, while still providing clear and concise information. We will work with you every step of the way to make sure you get exactly what you are looking for. AT ACF, you are never just a number. We take the time to get to know you by name and learn a little about what you do. 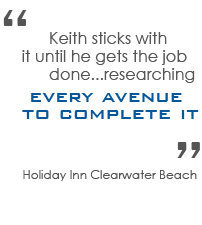 Our personal approach to effective business solutions makes us the best report designers Tampa has to offer. If your company is located in the Tampa Bay area, ACF is close by! We are located in Trinity, FL, just outside of Tampa. We invite you to call or stop by our offices and meet our annual report designers, marketing experts, web programmers, and IT department. Contact us today to see what ACF can do to help your business.